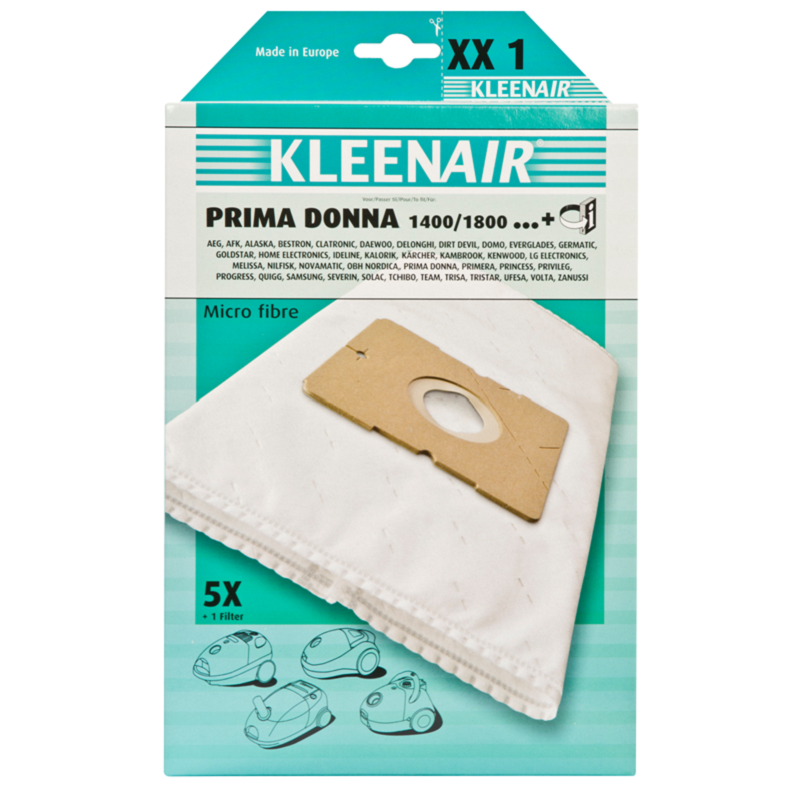 Unique structure of Kleenair vacuum cleaner bags enables good dust retention, high flitration and longevity. MELISSA: Arrow 640-038, Gran Voyager 1400W, Gran Voyager 1600W, VC-9108; VCC 16, VCC 14AU50, 640-002, Gardon 640-027. SEVERIN: BR 7495, BR 7942, BR 7948, BR 7952, BR 7956, BR 7960, BR 9694, SB 9517, 7925, 7926, 7935, 9020. SAMSUNG: Serie RC/VC 54.., 55.., 58..,59.., 60.., 62.., 63.., 64.., 67.., 71.., 74.., 76.., 77..., 86.., 89.., Digimax, Supero, Veloce-eco, 550, 4012, 5000, 5010, 5013, 1000E, 900E, Delight, Easy 1800, Home Clean, NC 6200, RC/VC 68.., SC 7820, Twister, VC 5956, VC 5980, VC5980 VN 3 B, VC 6713 H, VP 78, XSM 301, VP-50, VP-77, VP-95B. AEG: Smart 300 > 399, Serie Ergo essence 4570, 4580, 4665. ALASKA: VC 1600, 7925, 7926, 7935, 9020, BS1230 BS 1400…, VC 2000, VC 2030, VC 9009 E.
DAEWOO: RC 105(D), RC 107 > RC 108, RC 170, RC-190 (K), RC 205 (D), RC 209 (A), RC-406, RC-407, RC-450, RC-550, RC-605(D), RC-609(D), RC-706(D), RC 805A. GOLDSTAR: 982 E > 10250 E, T 2600. 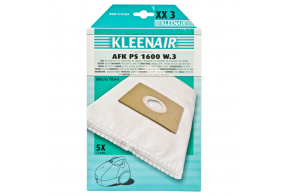 AFK: BS 1500, BS 1800W, BS 2000W, PS 1400W.3, PS 1400W.3NE, PS 1600W.4, PS 1600W6.NE, PS 1600. BESTRON: DVC 1300S, DV 1400EL, DVC 1500E, 1500EC, DVC 1600, DVC 1600E, EDVC 1800E, DVC 2020. CLATRONIC: BS 1204 > BS 1205, BS 1211 > BS 1215, BS 1219 > BS 1220, BS 1221 > BS 1223, BS 1225 > BS 1226, BS 1232. DIRT DEVIL: Powerline 1800W, M1806. HOME ELECTRONICS: Delfin 1800 watt. IDELINE: Atlantic 740-068, VC9902, Bora 740-091, Breezy 740-073, Chinook 740-090, Cyclone 740-074, Forza 2000 740-094, Mirage 740-067, Monsum Midi 740-039, Opal 740-08900, optimum 740-109, TEK-VC0299, Silence, Sirocco 740-048749, Viento 740-080, 740-048, 740-049. KALORIK: 963102, KA VC 6, Maxiclean, megaclean, Superclean, Ultraclean, vc 10. KAMBROOK: KVC 800, 900, 1000, jaguar power. KÄRCHER: TSC 500 > TSC 505. KENWOOD: KS3100 > KS3200. LG ELECTONICS: V2600E//DE/HTE, V26200B/DE/TE, V-982, Turbo 4000, TB 42, VCQ 302 HEU. NILFISK: Action A 100, Astral, GM 100 sprint. OBH NORDICA: Excellent 7200, 7210, 7230, 7274, 7290, Orion 7205, Serius 7240. PRIMA DONNA: 1400, 1800, PR-1401E, PR-1801E, 2000. PRIVILEG: 99.493, 110.047, 565.935, 732.278, 883.857, 886.409, 889.909. TCHIBO: TCM 05609, TCM 59290, TCM 66390, TCM 69534. TEAM: ST20E. TRISA: Beetle Galaxi 9065, Blacky 9062, Edel Beetle 9080, Hurricane 9063, Maximo, Diamond, Crystal, Clean air, Plat cruiser, Cazy clean, Classic power, Picup 9059, Picup 9075, Power Plus 9049, Power Plus 9076, SuperVac 9082, 9057, 9401 > 9043. TRISTAR: CJ-021, JC 802, JC 802E, JC 831, JC 862, VC H4201, NK-102A. UFESA: AT7310 > AT7313, AT4201 > AT4202. VOLTA: U3201, U4220.